Diving in Croatia as an adventure vacation has exploded in popularity the last 10 years even though diving clubs and courses have been on the Croatian coast since the 1950s. You'll now find diving clubs and centres on nearly every Croatian island as well as dozens of coastal towns. Croatia's underwater treasures include wrecks, coral reefs, caves and endless schools of fish. 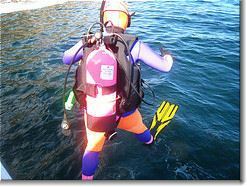 The best diving in Croatia tends to be in comparatively deep water; beginning divers need to choose carefully! The sea is shallowest around the Istrian coast (at around 50m) but becomes progressively deeper the further south you go. The deepest point is around Jabuka island (70km northwest of Vis Island) where the water is as deep as 1300m. First of all you need a Croatian diving permit in order to dive legally in Croatia. It costs 100Kn and can be obtained from dive centres and dive clubs on presentation of your passport and diving certification card. It's valid for a year. Even with a general permit, you need a special permit to dive in the Kornati Islands National Park , Mljet National Park and a number of other locations. The cost (100Kn) and paperwork of the permit is handled by the dive club organising the dive. 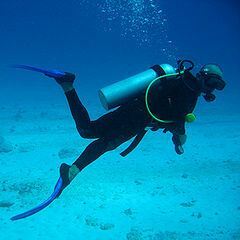 The diving season runs from May through November. Don't hesitate to dive in September and October; the water is still warm and the crowds are much less. The rough, cold waters in the winter months make diving unpleasant. Summer water temperatures range from 22°C to 25°C at the surface but drop to 19°C below 12m. Most people are more comfortable in a wet suit even in summer. Winter water is a chilly 11°C at the surface. Although there is little surge and minimal tides in Croatian waters, wave height runs from 0.5m to 1.5m but can be as high as 5m. Currents are weak in most places but watch out for the channels and passages between islands. Get your C-card or improve your scuba skills in Croatia. Both PADI and CMAS offer courses in Croatia but the best would be the Blue Planet diving centre in the Dubrovnik Palace Hotel. It's the only PADI Five Star Dive Resort in Croatia which means that you can go from an Open Water certification right through a Master Scuba Diver course. No matter which outdoor activity you engage in, I highly recommend that you purchase a travel insurance policy. You'll get the best possible deal by going through World Nomads. The policies are flexible and can be purchased or upgraded at any point in your trip. Prices are highly competitive and coverage includes 24-hour emergency assistance, trip cancellation, theft, full medical reimbursement and an option for coverage of a wide range of adventure sports. There are also a number of extras such as travel alerts, language guides and on online travel journal. Diving locations with detailed information. has the latest info on permits.